What a treat to be able to stand on my deck with a cup of hot coffee and see soil.. even it is only the top of the big hill of soil that was dug out of the pond to be.. Even if I know its fleeting as a snow storm is moving in.. they say we will get a few inches or maybe another six inches if it really hits us. It just makes the spring like moments seem even more special.. like playing in puddles LOL Lets put those new muck boots to good use right! 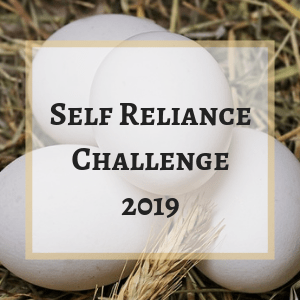 As I look around my own farm and see all the thing that need to be done, it can be easy to feel overwhelmed, spring is truly coming now and its in the middle stage of needing to get the winter clean up done, the garden’s prepared and planted out. Breeding programs, spring flood of eggs and chicks a more. One foot in front of the other will get you there.. break it down, plan it out and work the steps! It will all come together. Now I am going to turn this to a little bit of a darker side.. The world this week has been far more overwhelming in many ways. It does not seem to matter where we looked this past week, every day seemed to bring something new, be it Mass Shooting attacks, Plane Crashes, Weather Based events that have taken SO many lives both human and animal. So much loss of homes and livelihoods. I fully believe that there will be farmers that will lose their farms this year due to some of the things that have happened, I know there are thousands that have lost their homes and there are hundreds this week that are mourning the loss of their loved ones. I wish I could make it all better.. I just have to face it, look it in eye and chew it over. I need to listen to the voices crying in the wind and close off the rest of the world and truly hear them. I need to slow my mind and do my best to put “my way of seeing the world” to the side and try to grasp even in the smallest way a different view-point, a different culture. Then I need to slowly get up, shake myself and start to move again. Start to do.. slower, sadder in some ways, reminded to find joy in little things, reminded to tell those I care about I love you more often, to slow down and play with my hounds, say yes to the purrpot that asks to come up for lap time, take more time to listen to the wind, to smell the awakening earth, to feel the sun on my skin.. to be reminded of the awe of watching a seed sprout and grow into this fragile shoot of green, reaching for the light. 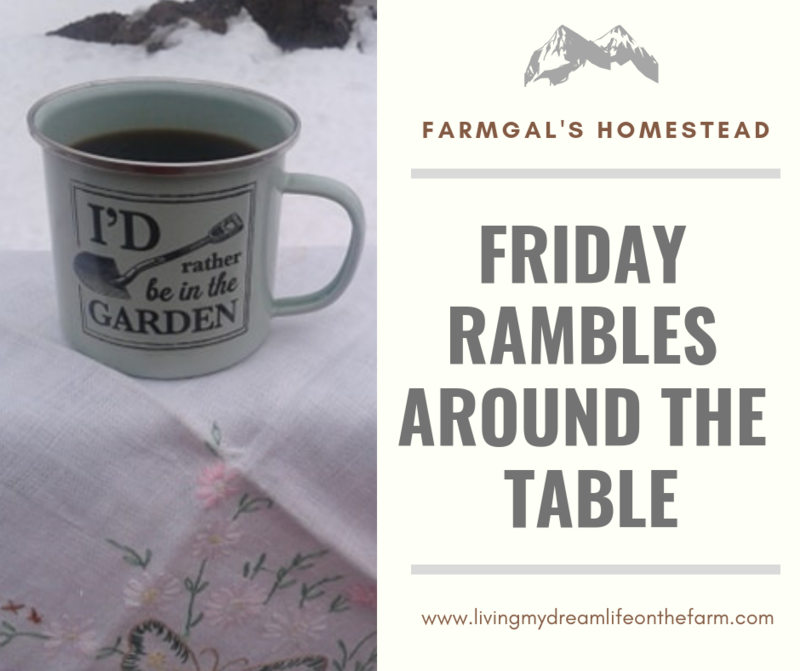 This entry was posted in At the kitchen table and tagged Farmgal's Friday Rambles around the table. Bookmark the permalink. Happy Friday Val (or, well, as happy as it can be). I’m off to work as normal this weekend, but Saturday evening we are celebrating Husband’s sister’s 30th birthday. It will be nice to see the family. I understand where you are coming from – there is so much misery in the world, and it’s all down to how people behave. I find that what helps me not get sucked down into it, is to look at people’s responses to these things. That people are making changes. And that there are people who are helping. And protesting. You are so good at expressing yourself in words. It is overwhelming sometimes to see all the hate, destruction, and sometimes just nature that destroys lives. It’s almost like sometimes when there are so many mass shootings that we also become a normal and we can’t let that happen. Hate spreads so fast but if we do pray for healing of our society and the many problems we have in our world we have hope. Hope is so important to hold on to. Thanks for sharing your thoughts. Have a healthy, happy & blessed weekend.